Phenix Technologies offers both economical and easy to use Partial Discharge and Radio Influence Voltage measurement systems which may be purchased separately to be used with existing equipment or packaged with other Phenix equipment to create a complete system. from 10 kHz – 10 MHz in 10 kHz steps. a must for any prevention and maintenance department. translates them into audible range. equipment is user friendly and does not necessitate any training. The RIV meter is an instrument for the measurement of Radio Influence Voltage according to NEMA 107-1987 and other relevant standards (ANSI 63-2-1996, VDE 876, DIN EN 55016-1-1). The instrument has a bandwidth of 9 kHz and a tunable center frequency of 10 kHz-10 MHz. for high precision high voltage insulation diagnostics. 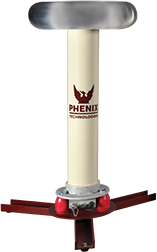 Phenix Technologies manufactures coupling capacitors in wide variety of voltage ratings. Also known as power separation filters, these capacitors are characterized by their low partial discharge specification and low self- inductance design. This makes these capacitors ideally suited for sensitive partial discharge or RIV measurements in a laboratory setting. The generously sized high voltage electrodes ensure corona free operation at full voltage completing a ready to use coupling capacitor compatible with most partial discharge measurement or RIV instruments. Higher voltage ratings are available. These capacitors typically 100 pF value; offer the ability to couple a known PD pulse on while the system is energized. Phenix stocks 100 kV capacitors and they are available in 200, 300 and 400 kV. Phenix also offers 150 pF capacitors to support older partial discharge detectors. A variety of voltage ratings are available.